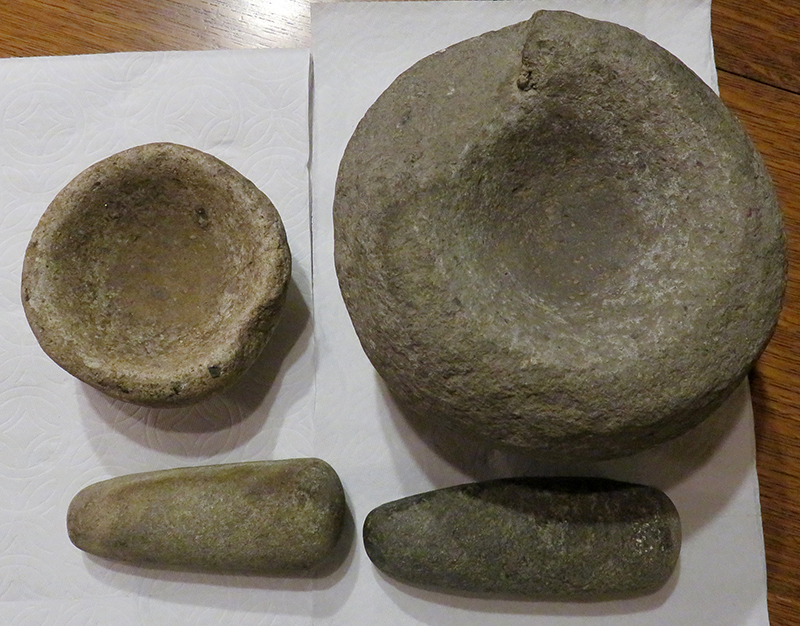 SCVHistory.com LW3120 | Bouquet Canyon | 2 Mortars, 2 Pestles, Discovered 1920s-1930s. 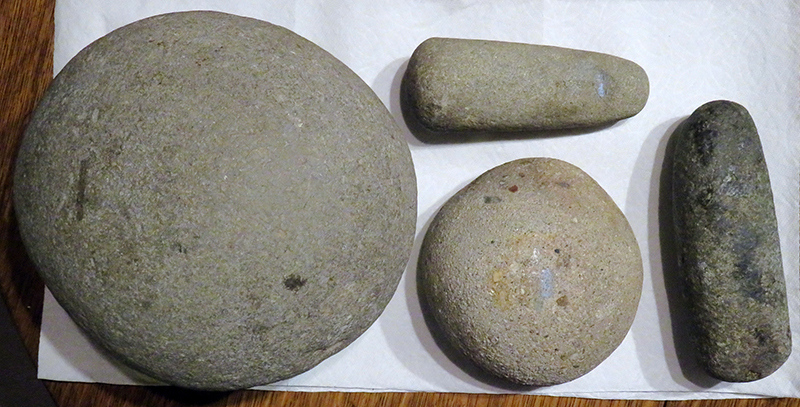 Two stone mortars and two pestles discovered in Bouquet Canyon during road grading in the late 1920s or early 1930s by Walter Carroll Harris, who was working for the County of Los Angeles as a road grader. The largest mortar measures 8.5 to 9 inches in diameter — the size of a bowling ball — and weighs as much. 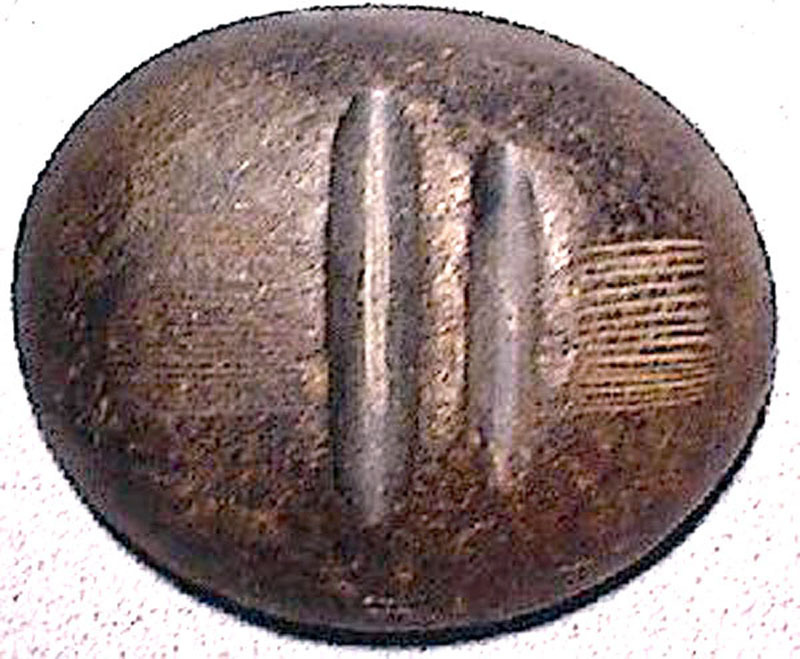 Both mortars, especially the smaller one, show possible traces of asphaltum around the rim, suggesting basketry hoppers might have been attached when they were in use by local indigenous Tataviam women. The finder, Walter C. Harris, established the Blue Cloud Mining Co. in Bouquet Canyon and mined chinchilla dust. His son, Norman Harris (1941-2013), inherited the business and served on the board of the Santa Clarita Valley Historical Society, as did Norman's wife, Cynthia Neal-Harris, from whom these materials were obtained in 2017. LW3120: Materials purchased 7-9-2017 by Leon Worden. Accession numbers: LW.SCV1714 and LW.SCV1715 (mortars); LW.SCV1716 and LW.SCV1717 (pestles).